The barred crossword looks like the image on the right of this page. As you'll see, the puzzle grid looks quite different to a normal crossword. As opposed to having some cells filled in black to show the gaps between the across and down clues, called runs, in the barred crossword the end of a word is marked with a bar, or thicker line, hence the name barred crossword puzzle. 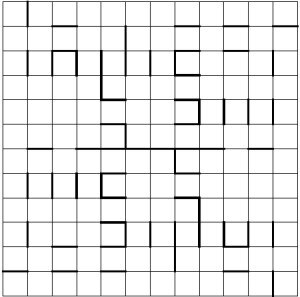 There tend to be many more runs in a barred crossword than a standard puzzle (particularly with orthodox UK grid patterns). The pattern of bars may be symmetric or asymmetric depending on the particular grid. The words used in the grid are often more obscure than in a normal crossword, however because there is a lot more crossover, there will generally be quite a few clue letters for each word and therefore more of a helping hand than with a standard crossword puzzle. The clues are also presented differently in a barred crossword. As opposed to having numbers in the cells corresponding to an across/down clue, instead in the barred crossword clues are split into which row or column the answer words they refer to are in; and if there is more than one word in a particular row or column then either a dot or a '|' symbol is used to denote that in the clues.